﻿ HuntingNut » Forums » Firearms, Shooting & Reloading » Gun & Firearm Discussions » Firearms International Corp.
Posted: Thu Jul 13, 2006 3:40 pm Post subject: Firearms International Corp.
(Like revolvers). There is no serial number or anywhere that I can see where it would have been or been filed off. There is some signs of corrosion on the barrel, mostly blackening of the metal. Anybody out there heard or know anything about this thing or the company that built it? It looks like it may have been a great little plinker for a kid learning to shoot. I am going to ask if I can get a couple of pictures of it. I will post them if I do. Posted: Thu Jul 13, 2006 4:01 pm Post subject: Re: Firearms International Corp.
Posted: Tue Jan 08, 2008 10:18 am Post subject: Re: Firearms International Corp. I have that EXACT same gun and am looking for info on it also, so if you find anything please let me know. Thanks! Posted: Tue Jan 08, 2008 11:24 am Post subject: Re: Firearms International Corp. PLEASE post a pic of it. It sounds like a really interesting piece to me. Posted: Tue Jan 08, 2008 2:43 pm Post subject: Re: Firearms International Corp. The rifle you are describing is probably the Garcia Bronco as pictured or the Rau Arms Wildcat (Ozark Mountain Wildcat), see web site photo, both of which were sold by International Firearms. The wildcat was made in several models and had a twist action and a twist takedown and disassembly. The Wildcat pictured is a late model, the last made, an early model would probably be closer to the gun described. Posted: Tue Jan 08, 2008 3:39 pm Post subject: Re: Firearms International Corp.
Posted: Wed Jan 09, 2008 6:08 am Post subject: Re: Firearms International Corp.
Posted: Thu Feb 14, 2008 1:46 am Post subject: Re: Firearms International Corp. Anyone know what they are worth????? Posted: Sat Feb 23, 2008 8:32 pm Post subject: Re: Firearms International Corp. 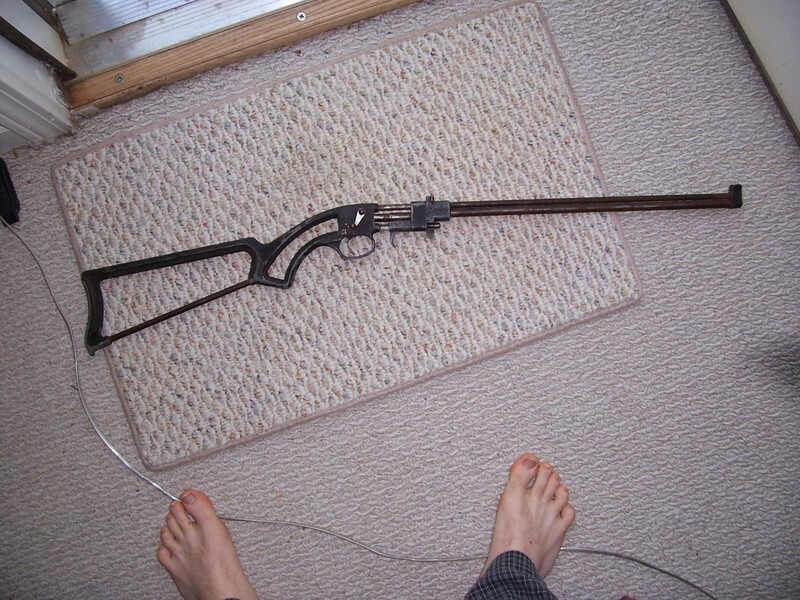 I ALSO HAVE A RIFLE MADE BY FIREARMS INTERNATIONAL,IT BELONGED TO MY GREAT AUNT. I HAD A CHAMBER CAST DONE, I WAS TOLD IT WAS A 7mm-06, MADE IN THE LATE 50's EARLY 60's. THE SERIAL# IS 361, I DO NOT KNOW IF IT IS WORTH ANY THING, BUT I WOULD REALLY LOVE TO SHOOT IT. DOESE ANYBODY KNOW ANY THING? Posted: Mon Mar 17, 2008 8:12 pm Post subject: Re: Firearms International Corp.
Posted: Tue Mar 18, 2008 5:14 am Post subject: Re: Firearms International Corp. If you rifle is indeed a "7mm-06" it is essentially what is known today as the .280 Remington. I would beware of using current .280 ammo however since it may have been a custom chambering with some gunsmith's own idea of case shoulder and other dimensions. It should be an easy task to have whoever did your chamber cast compare the casting with current SAAMI specs for the .280. If it is a .280, you have a very efficient cartridge that just happens to be one of my favorites for medium to medium-large game. Even if it is a 7mm-06 wildcat, you might be able to contact RCBS for appropriate dies and get it shooting. Starting loads for the .280 should be a good place to begin if the rifle is in sound shape. Check it out and let us know. Posted: Wed Mar 19, 2008 10:32 pm Post subject: Re: Firearms International Corp. I remember those rifles, as a matter of fact a friend of mine owns one. I seem to remember them being referred to as "Survival" rifles supposedly issued to U.S. aircrews. I'll have to check my archives and see if I have any more info. Posted: Mon Apr 07, 2008 10:33 am Post subject: Re: Firearms International Corp.
Posted: Mon Apr 07, 2008 11:31 am Post subject: Re: Firearms International Corp.
Alright Slickrick...Welcome aboard...I see you have already pulled up a stump You did grab a beer didn't you? Posted: Mon Apr 07, 2008 11:40 am Post subject: Re: Firearms International Corp.